I am your constituent, and I stand strong in opposition to SOPA and PIPA. What’s more, I am a web developer, and I know intimately the problems that can arise from such legislation. Keep the Internet free and open. Foster sharing and creativity. Would you use a house fire to end a termite infestation? Deny big media corporations in their wishes to end piracy, and they’ll be forced to turn to young entrepreneurs and new businesses to solve their IP problems. Create jobs, don’t destroy them. Thank you for your time, and for hearing me out. I hope your better judgement is in line with your constituents as you consider your stance on these two important and dangerous acts before you. All joking aside. This is a serious issue, and you can take part in the solution. 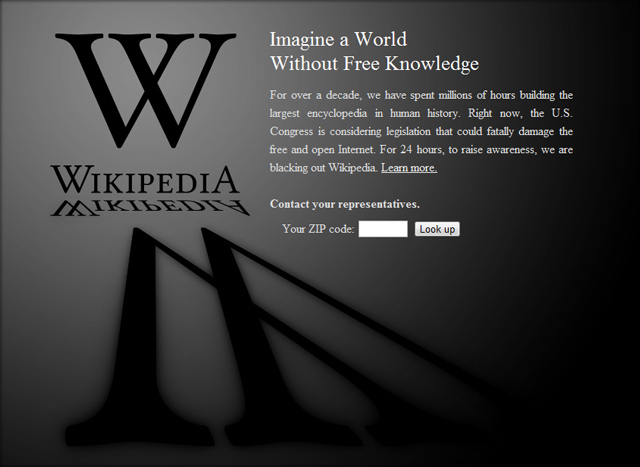 Help stop SOPA and PIPA today!